Incorporated within David Kerwood Construction is our own steel fabricating department. This is capable of the design and manufacturing of all manner of items, from the smallest of ornate iron work to the full fabrication of new steel buildings. The steel department uses the latest methods and techniques, including computer aided design and manufacture. 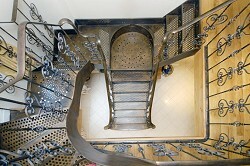 A traditional iron staircase hand built by David Kerwood Construction. 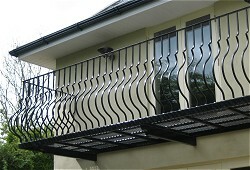 A metal balcony fabricated entirely by our steel work department.